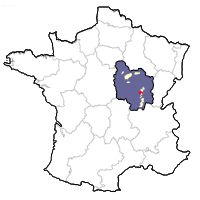 The Côte de Beaune vineyards cover a distance of only about twenty kilometers. They begin at Ladoix-Serrigny in the north and run southwest through some of the most famous names in Burgundy — Pommard, Volnay and Chassagne-Montrachet (to name a few) — terminating at the vine-covered Premier Cru slopes of Maranges. The soils generally consist of marl-based limestone and subsoils of marl from the middle and upper Jurassic period. The higher elevations on the western side fall under the AOC Hautes-Côtes de Beaune. At between 280 and 450 meters above sea-level, these vineyards are well-exposed. They often grow on steep hills covered with limestone scree brought down from rock formations higher up. Most of the wines in the Hautes-Côtes de Beaune are red, but about 15-20% are white. The whites have floral aromas, along with flavors that include pear, ginger and honey. These are wines that display some class while also being highly affordable. Versatile at the table, they are usually good partners for fish, poultry, blue cheese, goat cheese and Gruyère.